Acoustic Shapes combine aesthetics with acoustic performance. Audimute's 3D Wall Tiles break up hard surfaces decoupling sound waves. Designer Shapes are made with our eco-C-tex® absorption material. Create designer tile patterns with varying depths or flush designs. Tiles can be spaced apart or tightly fit together. 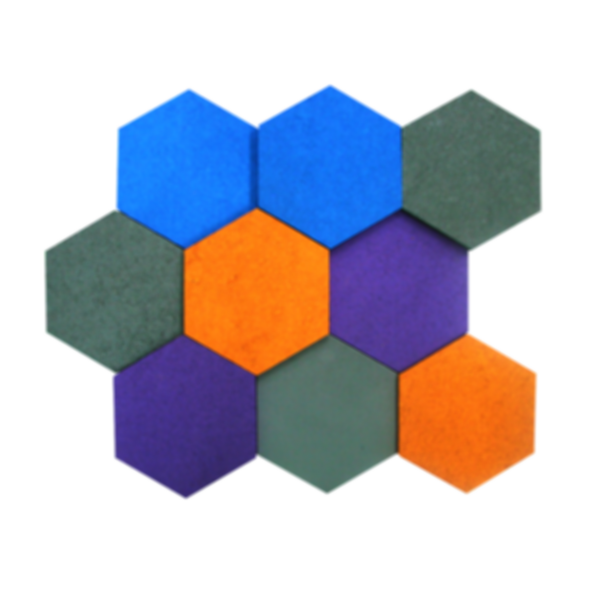 Acoustic Shapes are available in several standard color options or you can choose your own custom color. Find a color that matches your existing décor or select a color that will be the focal point in your space. Browse colors on Sherwin Williams' website and enter the color option you love in the field above. Bring your wall art ideas to life by adding acoustic designer shapes to any space. They are perfect for adding an artistic touch to your home office space in addition to promoting a positive acoustic environment. Acoustic Shapes are great for commercial spaces too! Build your acoustic design in high traffic areas to bring a designer look that helps to reduce the busy sounds of your space. For almost 20 years Audimute has set the standard in providing free sound advice acoustic design consultation and cutting edge acoustic treatments. Today Audimute is a leading soundproofing company producing eco-friendly 100% made in the USA.